This article is being written about a very common problem I see in many homes. 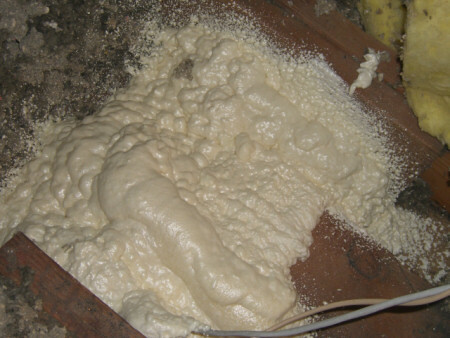 This particular case happens when wall cavities are used as part of the return duct system. 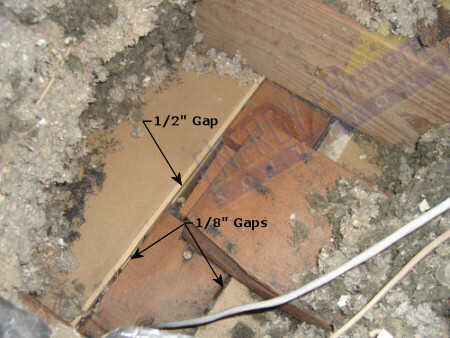 In this case a return boot is attached to the top of the wall cavity in the attic, and a return grill is placed low on the wall near the floor. Air is drawn in through the return grill, up the wall cavity and into the return duct. Unfortunately, that is not the only place air comes in. I took this picture of the walls top plate from up in the attic. As you can see there are many spaces in which hot attic air was being drawn in. When I pressured the return system with a duct blaster, I could feel quite a bit of air blowing out these spaces, especially the 1/2" gap. Also, notice the 3/4" hole drilled through the plate for the wire. In fact the air coming out was strong enough to blow small pieces of insulation out of the way. Under normal operation, the air handler pulls hot attic air into the return through flaws like these. To fix this problem, you will have to locate and uncover the top plates near each wall cavity that is used as part of the air distribution system. Though pressurization testing, I've noticed that air leaks out of the top plate on about 5 feet of each side of the main wall cavity. I recommend sealing at least the first 6 feet on either side of all wall cavities used as a return. You can also use a smoak pen while the air handler is running to locate the leaks. You can seal these area with expanding foam or caulk. The easiest way to seal these top plates is to use our quick curing spray foam kits. Using the cone nozzle you can spray a 6" wide stream of foam to completely cover and seal off this plate. The picture below is the same same top plate after it has been sealed with our polyurethane spray foam insulation. Click the link below for more information and pricing on spray foam kits.